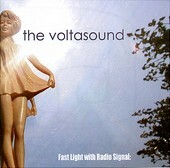 Shoe-gazers and proud of it, the Brit-pop influenced The Voltasound deliver a drippy debut with Fast Light With Radio Signal:, a five-song EP on the newly formed Elephant Stone Records. The dazed vocals sing over acid-y guitars while the subtly laid rhythm section eases itself from one beat to the next, half-reluctant, half stoned, their reflexes slowed to the point of barely being able to function. But the music in their blood comes pouring out, sliding like molasses as the timid rock holds back. Keeping their distance while still making you believe something is brewing, they lure you in, play with your mind, and keep things constant. The record is a good listen the first few times through, but unless you're stoned, the tried and true becomes tired and blue. The laid-back "You're Nobody's Girlfriend", however, hints at a more melodic, straight-ahead direction for the band, a pleasant switch from the drone of their other songs. I'll give this a C+.